A one-of-a-kind gold coin believed to have once been a cherished memento of U.S. President George Washington made its first public pre-auction showing since 1890 when Heritage Auction put it on display June 14 at the Long Beach Coin and Collectibles Expo in Long Beach, California. The gold coin will be sold without reserve at an August auction during the ANA World’s Fair of Money in Philadelphia. It is only the third time in its history that this piece has been offered at public auction. 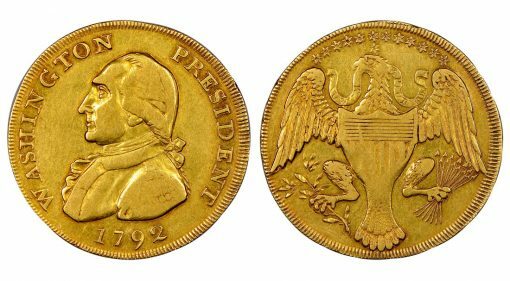 Research strongly suggests the 1792 Washington President gold eagle was expressly struck for, presented to, and carried by George Washington. Furthermore, a 1792 letter to Washington located in 2010 provides compelling evidence that the coin was struck for Washington in Newburyport, Massachusetts, by polymath Jacob Perkins, rather than in England as previously believed. "The Washington President gold eagle is both unique and monumentally important, being the earliest gold pattern submitted for consideration as a United States coin," said Jim Halperin, Co-Founder of Heritage Auctions, which will auction the coin in August for the first time in 128 years. "Numismatic researchers widely agree that it is almost certainly George Washington’s own pocket piece." Both in 1875 and 1890, its only previous public auctions, the gold coin was described as likely struck for Washington and carried by him. Since its creation in 1792, this gold coin has been held by Washington himself and the most elite numismatists. In 1933, "Col." E.H.R. Green, son of the "Witch of Wall Street," Hetty Green, purchased it privately for more than $2,500, a huge sum in his day. Eric P. Newman acquired the coin in 1942, and it has not changed hands since. Newman died in 2017 at the age of 106 and is best known as the most gifted and admired numismatic scholar, author and researcher of his era, as well as for creating what experts consider one of the nation’s most significant coin collections. Since 2013, more than 19,000 lots from Newman’s collection have sold for over $72.9 million at auctions conducted by Heritage, with all net proceeds benefiting various charities. For Newman, who at one time owned all five known 1913 Liberty nickels (today worth over $3 million each), one coin always stood head and shoulders above all others. How could anyone with such a vast collection, and such a long history of numismatic scholarship, point to a single specimen and call it his favorite coin? For Newman, it was obvious, for no other numismatic artifact of early America connects present-day collectors and historians to our country’s most foundational statesman more closely than the 1792 Washington President gold eagle. In 1975, Newman writes: "This coin is unique in that it was owned by George Washington. It is unique as the earliest gold pattern prepared for the United States coinage; and it is unique because only one example of the coin was made. What other American coin can command historical and numismatic respect of that magnitude?" "To my father, George Washington and Ben Franklin were personal heroes," son Andy Newman said. "He considered Washington’s refusal that our country’s first coinage depict his own image on it to be an emblematic example of Washington’s profound humility and willingness to put country before self." "Since Washington, only eight other collectors have owned this coin," Jim Halperin said. "One very fortunate individual is destined to be the next guardian of this quintessential prize, George’s Coin."